Journey to fascinating towns steeped in centuries old history, where religious artifacts abound, sacred buildings captivate and ancient dwellings amaze. 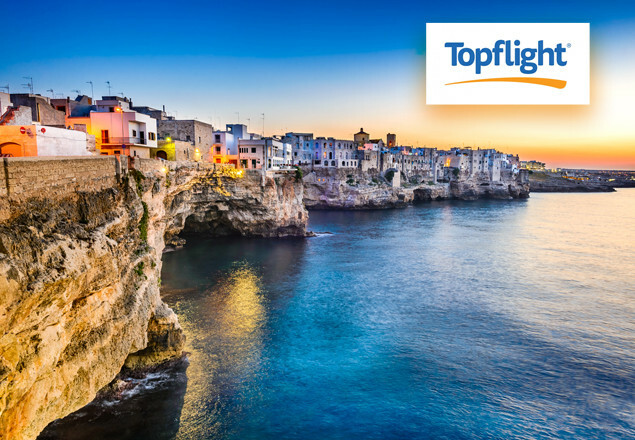 We have teamed up with Topflight - Ireland's Italian Specialist, to offer you a chance to avail of an exclusive 7 night escorted tour to Puglia Italy. With this offer you will stay 7 nights at the 4 star UNA Hotel Regina in Noicattaro on a half board basis, travelling on Monday 19th June. 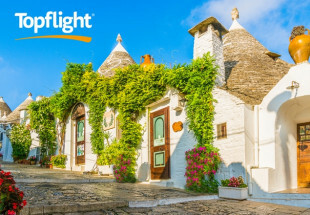 This holiday also includes flights, transfers and excursions including an excursion to San Giovanni Rotondo, a guided excursion to Matera plus a typical traditional lunch at a local masseria and an excursion to Polignano a Mare & Monopoli. Also included is meet & greet service at the airport, 20kg checked in baggage and all airport taxes. Stretching from the Gargano peninsula to the heel of the Italian boot, Puglia also known by its Roman name of Apulia is a unique part of Italy, just begging to be explored. An unspoilt landscape is dotted with whitewashed villages, rolling hillside strewn with ancient castles and sandy beaches edged by rocky mountain ranges sweeping down to the Adriatic Sea. One of its most striking features is its trulli - old whitewashed stone buildings with conical roofs, seen mostly in Alberobello. This is an ideal destination for anyone seeking to avoid the hustle and bustle of the busier Italian resorts and escape to a more secluded region where tradition and warm hospitality are a way of life. Regarded as the Garden of Italy, Puglia is an important producer of olive oil, pasta and wine and the region positively celebrates food. 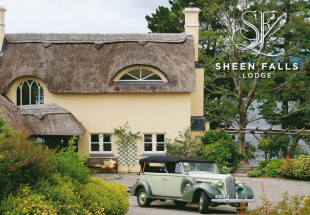 Cycling is also a popular pastime and there are certainly plenty of views to admire whether you explore the landscape on two wheels, drive through it on four, or simply relax in the grounds of your hotel and enjoy the beautiful surroundings. On arrival to Bari airport, direct from Dublin, you will be met at the airport by a Topflight representative and transferred by coach to your four star hotel for the next seven nights, located just 40 minutes away. Perhaps you’d like to enjoy exploring Bari’s historic centre, located just a shuttle bus and a short train trip from your hotel. Take a long and leisurely lunch in one of the many restaurants dotted throughout the historic centre, before wandering its narrow streets and quaint piazzas. A top attraction in Bari is the 11th century Church of Saint Nicolas. 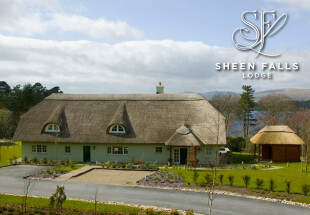 Pay it a visit to see its fantastic façade and beautiful interiors. This morning, you will be picked up from your hotel by coach and brought to San Giovanni Rotondo, home to the Shrine of Padre Pio, the second-most visited Catholic shrine in the world. Filled with fascinating religious buildings and monuments, today you will get to explore these intriguing surrounds in the company of a local guide. The saint’s tomb lies inside the Church of Our Lady of Grace, and it is here you will find a wealth of artifacts including the crucifix from which Padre Pio received the stigmata. Nearly everything the saint owned or touched is also found here, carefully preserved and labeled. You will also have some free time during the day to enjoy lunch in one of San Giovanni’s eateries, before heading back on the coach to your hotel. Enjoy a well-earned rest at your hotel. Luxuriate with a massage or beauty treatment in the hotel’s Regina spa, which comes complete with Roman sauna, Turkish baths, thermal swimming pool, and Jacuzzi. Enjoy a relaxing drink or two at the hotel’s bar, or relax in a sun lounger by the outdoor swimming pool. After a hearty breakfast, you will take your coach transfer to the impressive town of Matera, where you will enjoy a guided tour. Renowned for its cinematic landscape and ancient cave dwellings, also known as sussi, this UNESCO World Heritage site is one of the most awe-inspiring in Italy. Don’t forget to bring your camera to this mesmerising site. Afterwards, you'll experience a typical traditional lunch with locally sourced produce at a local masseria. This morning, you will be collected from your hotel after breakfast, and brought to the beautiful town of Polignano, famous throughout the world for its mouthwatering gelato. It’s not just the ice-cream that will make you fall in love with this town, however, it’s the glorious surrounds too. Located on top of limestone cliffs, overlooking the ocean, this historic town is a beautiful labyrinth of narrow roads and alleys, lined with plenty of shops, bars and restaurants for you to peruse! Next stop? Monopoli, famous for its vibrant harbour. Take some time out to enjoy a seafood lunch at one of the many great restaurants, after which you can explore its sights, which include a 16th-century castle and imposing Baroque cathedral. Should you wish to make another refreshing pit-stop along the way, head to the city beach for a little dip in the clear, clean waters of the Adriatic Sea. Later, you will return to your hotel on the coach. Still thirsty for activities? Why not hop on the shuttle bus to the train station, and the train to Bari town. Here you can take the 50-minute train to the medieval town of Ostuni, also known as the 'White Town', thanks to its medieval delightful white-washed buildings, which perch strategically atop a hill. After breakfast, check out from your hotel, and transfer to Bari, where you'll have an opportunity to explore the capital of Puglia. You can admire St Nichola's Basilica or the cathedral of Saint Sabino, not to mention free time for shopping and lunch. In the afternoon we depart for the airport for your return flight to Dublin. This holiday is available for travel on Monday the 19th of June. Purchaser of this offer should call immediately to book with Topflight on 01 2401700 or email:sales@topflight.ie as seats are limited, with your name and voucher code. Deadline for booking with tour operator is Wednesday 14th June 2017.